We’re going bold and beautiful today with WWW readers Sam and Christinna’s wedding which was held on the 16th August 2018. 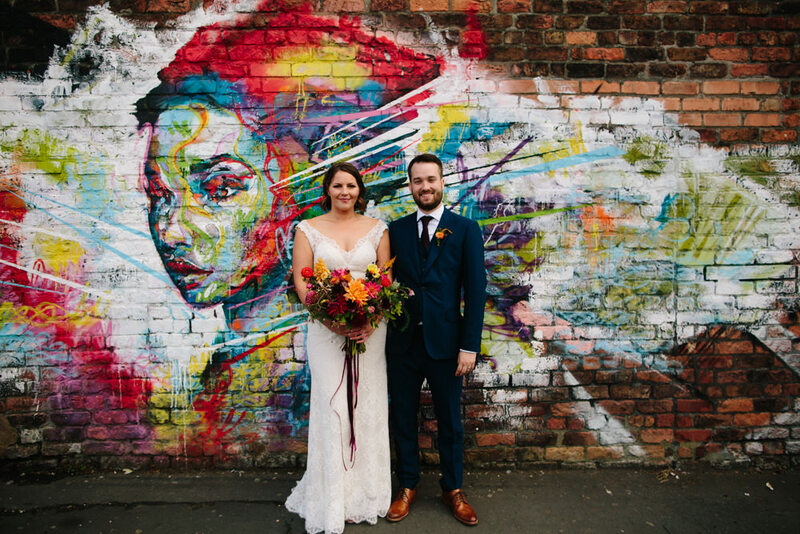 Following the legal ceremony, the whole day took place at the vibrant Constellations, Liverpool. I’m really enjoying their fuss free approach to the décor and planning in general. You can’t argue with toasting after making major decisions and bookings! The venue itself really creates an impact so not too much decoration was needed, but the marvellously bright florals really added to the effect. The gorgeous bouquets and buttonholes were created by a professional florist but Sam and Christinna actually grew lots of the blooms for the table flowers and arranged them themselves, how great is that" As Christinna is originally from Denmark, there are some really lovely Danish traditions to look out for, from the yummy looking traditional cake that her Mum made to the cutting off of the ends of the groom’s socks on the dancefloor, I’d love to know the history behind that one! Dan Hough Wedding Photography captured all the fun and games in these beautiful images. Thank you so much for sharing with us Dan.